RevenueCloud™ is the first native Salesforce App that performs Opportunity, Product and Schedule Splitting between multiple Reps and Calculates Commissions for all types of Salesforce Opportunities including Products and Schedules. 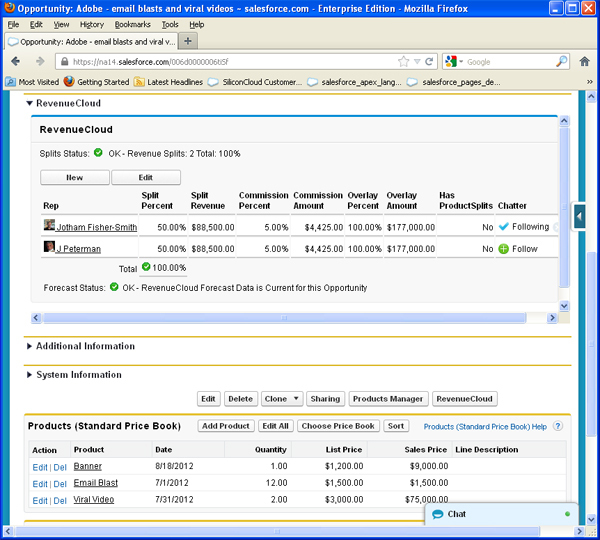 With RevenueCloud™, you will continuously have real-time Split Opportunity Revenue, Commissions, Expected Revenue, Expected Commissions by Rep, Division, Account and Opportunity and more for daily, weekly, monthly, quarterly, yearly or custom time frames stored securely in your own Salesforce org and all data may be easily Exported to Excel. The RevenueCloud™ free trial is fully functional and there is no obligation to purchase. RevenueCloud will save you time, improve efficiency and visibility by getting rid of your time-consuming Revenue Splitting and Commissioning Spreadsheets and getting the data into Salesforce where you need it! Download your free evaluation of RevenueCloud from the AppExchange Here.